This kind of foreground/background treatment as seen at the Cerritos Sculpture Garden is something that you will commonly encounter in film and television. However, I captured this image somewhat spontaneously. I was photographing the groom I himself and then I noticed the bride over his shoulder laughing as she worked with my second photographer. 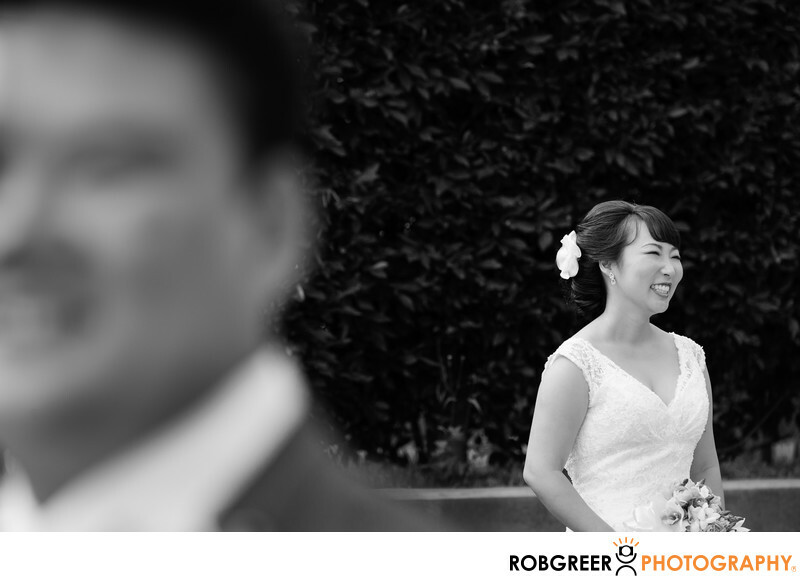 I quickly changed my focus area and snapped this image while keeping the groom smiling in the foreground, never noticing that I was photographing his bride. These kinds of unconscious moments are often quite appealing to my clients as it gives them an alternative view of the scene that they may have never otherwise considered. One of the things that I learned after working at the Cerritos Sculpture Garden was that the venue offers several interesting areas that are relatively unique for wedding photographers. It's also one of the only areas in or near Cerritos that is suitable for wedding portraits — at least as far as my tastes for locations are concerned. Cerritos Sculpture Garden is located in Cerritos, California. Phone: (562) 860-0311. Website: http://www.cerritos.us/VISITORS/art_in_public_places/cerritos_sculpture_garden.php. Location: 18125 Bloomfield Ave, Cerritos, CA 90703. 1/1250; f/4.5; ISO 400; 145.0 mm.